Abstract : Pain upper abdomen following laparoscopic cholecystectomy often presents with diagnostic dilemma. We present 13 cases of gall bladder / cystic duct remnant containing stones that presented with recurrent biliary symptoms. Material & Methods : Over the last 10 years, 13 patients were referred to our institution for the evaluation of unexplained recurrent biliary colic or jaundice post-cholecystectomy. Seven of them had undergone previous laparoscopic cholecystectomy and six had an open cholecystectomy. Results : Laparoscopic Re-cholecystectomy was attempted in eleven patients and we successfully treated 6 patients by laparoscopic completion cholecystectomy. The remaining 5 patients had to be converted to laparotomy for resection of retained gall bladder. Two patients who were detected with cystic duct stones, were managed with ERCP alone. There was no need for subsequent laparoscopic cholecystectomy. Post op recovery was uneventful. At a median follow up of 2 years, all patients were asymptomatic and disease free. 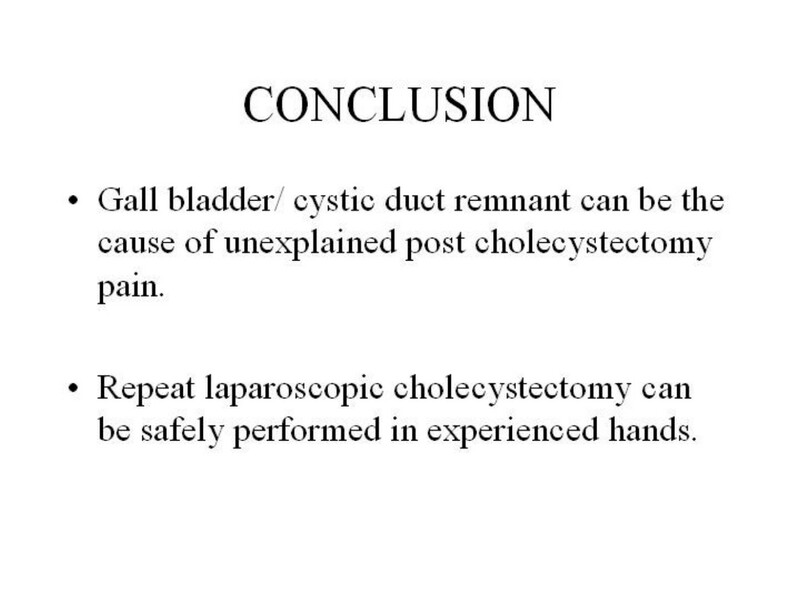 Conclusion: Gall bladder/ cystic duct remnant can be the cause of unexplained post cholecystectomy pain. Although technically demanding, repeat laparoscopic cholecystectomy can be safely performed in experienced hands.